I had the chance to host a workshop this weekend. The title “Becoming Obama” just came into my mind like two weeks ago. And i finally presented was in a cloister in Rinteln — worth enough to mention. For intro look at my blogentry before. We started “Becoming Obama” (unexpectedly) on a sunday morning — the last of the 2,5 conference days. So I was concerned about the 10 participants being exhausted. 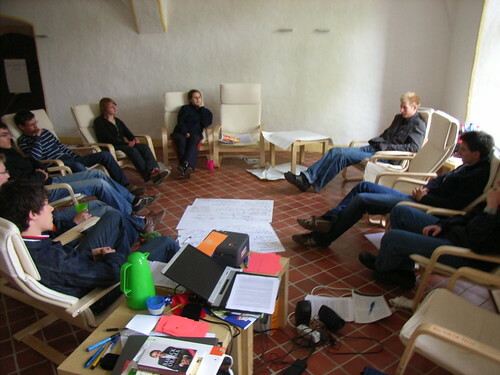 Plus there was another workshop on the “Grundeinkommen” (Basic income) following mine, but they were flexible so that i could present the fully intented 2 hours. So there was a tight last-day schedule and a freezy cloister: But under these circumstances, thanks to good preparation, i still could change some agenda points (without the participants noticing it), created a mindmap less and could come to the points quicker. 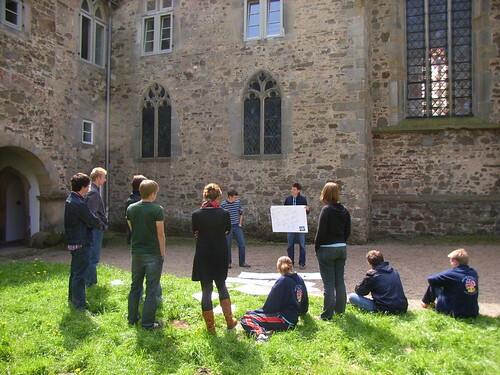 The participants worked out their flipchart-paper outside in the sun, in the cloister yard. This is the best compliment you can make on a workshop, as the design of a workshop should always make people want more — besides the secondary or tertiary aim to inform the participants. After the warming-up, the core of the workshop lasted 45 minutes: Particpants read excerpts of various stations in Obamas career (In the room I created a spatial connection to Kenya, Chicago, Washington, Hawai, Indonesia). I called it an “Obama Village”. If participants were already experienced, they could skim through the 2 Obama autobiographies or the full Wikipedia-entry on Obama’s policy and create a flipchart at the “freestyle-station”. Excerps from the autobiography were chosen by me on the criteria of being easy to read, as well as providing a good mixture of private stories and political ones (…the unpolitical is political!). 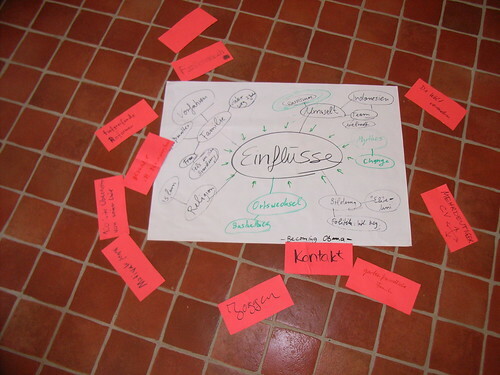 Then, Participants presented them in drawn tag-clouds on flipcharts or mind-maps. I closed my workshop with another emotional video, comprising the backwards/forwards idea in a biography, but also a “change message”. If you wanna have the concept, please mail me. I am also opening a facebookgroup concerning the further development of “Wissen 2.0” workshop lines. Simply join it, if you want to know more.